Fun. Energy. Moving. Shaking. Just some of the words that spring to mind. Barre (as in a ballet barre) style workouts have seen a dramatic increase in popularity over the last few years, and for good reason, they are fun and effective. 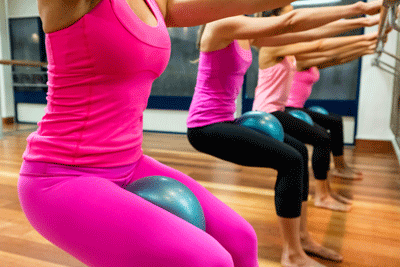 Barre classes and methods do vary but most combine elements from Pilates, Dance and Fitness. At Balance Moves we teach the Barre Attack method (www.barreattack.com) which was created by the owner of Balance Moves, Renee Scott. Barre Attack is taught all around Australia and also further afield. Renee describes Barre Attack as the perfect way to help with gaining a longer, leaner and fitter look. What some people call… ‘greater body confidence’. Renee was a former professional ballet dancer and is a master Pilates instructor so she knows what she’s talking about. 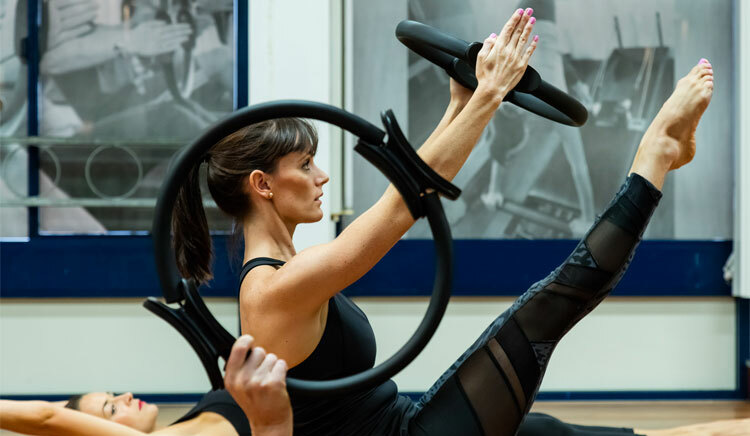 At the time of writing she’s taught over 400 other instructors how to teach Barre so you can expect the Barre classes in Balance Moves to be of the very highest standard. Barre classes are for everyone. You don’t require any special dance or Pilates experience. Like anything, with more experience you will improve and some of the moves will come more naturally. A good instructor will also lead you to harder variations. Introduction aside here is what you should wear, expect to see, do and feel. First, you should wear comfortable workout gear and either grippy socks or bare feet. When you enter a gym, dance, Pilates or barre studio that offers a barre class you can typically expect a large open room with fixed barres running down one or more walls, nearly always with mirrors. Each person in the class will have their place on the barre and will stay more or less in the same spot. You should ensure a good arm’s length distance from other participants. Balance Moves classes have a maximum of 20 people. Within a Barre class and in addition to the barre itself there may be some extra equipment. 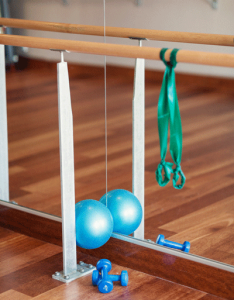 With the Barre Attack method you will typically see elastic draped over the barre, a Pilates ball (about 15cm in diameter), small hand weights and a mat. Depending on the class you could use all of these, or none. Throughout the class the instructor should be visible and may lead by example or walk around and demonstrate from different positions. If this is your first barre class it’s a good idea to let the instructor know so they can help you with technique if necessary. You should also let them know if you have any health issues, injuries or if you’re pregnant. Classes range from 45m to 60m and are held to music, 128bpm. That’s a good beat, and a good tempo. Classes will start with a warmup and then include a mix of barre, cardio and stretch sections that could include using the barre, elastic, ball, weights or mat. For much of the class you’ll have one or both hands on the barre or be doing exercises just off the barre. Don’t overdo it. Focus on your body position, breathing and timing. Have fun, and just go with it. Barre classes are a full body workout so expect and accept that it could be hard and might work areas that will surprise. If you need to take a break, take it. Remember those around may have been doing Barre Attack classes for years… those great legs and butts don’t happen by accident. For those who dream of dancing you will get a taste. Expect to hear terms like first position (heels touching, feet pointing in opposite directions), second position (heels at least shoulder-width apart and feet pointing in opposite directions), and plie (a smooth and continuous bending of the knees outward while keeping the upper body held upright). But it’s not all dance… you could also be doing burpees, lunges or a range of stretching. That’s it… After your first class be careful down the stairs! You’ll be tired and your legs will be wondering what just happened. That’s good though… that means it worked! 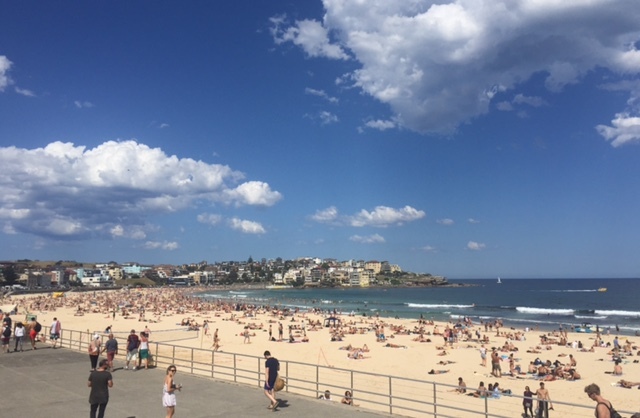 A good option then of course is to head down to Bondi Beach and relax! Finally, if you stick with Barre, you can expect results! Just take a look at anyone who has been doing barre classes a few times a week for several months. We call them Barre Babes!